But Every Dog is Different! But every dog is different! 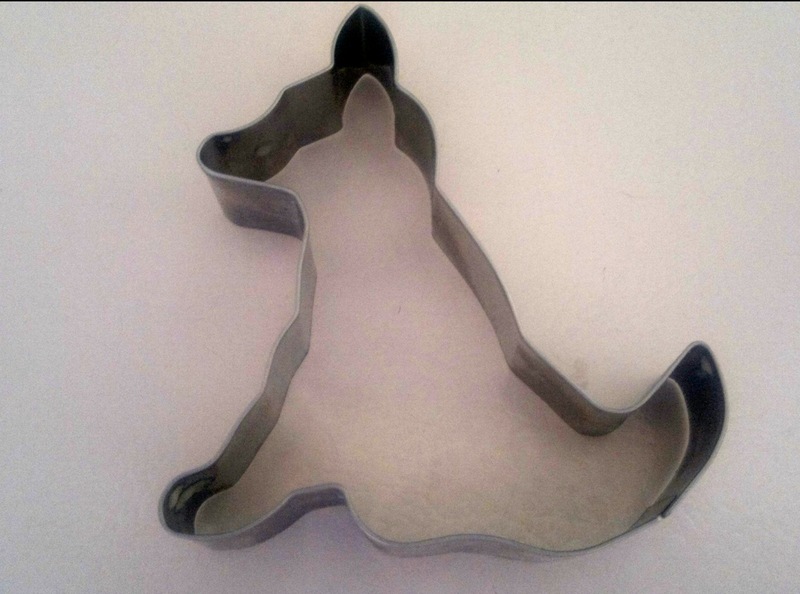 You can’t just use a cookie cutter! But every dog is different! Why limit yourself to only one method? But every dog is different! Some tools just don’t work with some dogs! The implication is clear: Trainers who use primarily positive reinforcement are slaves to one method, which we apply to all dogs. We deliberately limit ourselves, despite the wealth of methods available to us. We ignore some of the tools in the toolbox. We are close-minded. In addition, we just don’t seem to recognize, in the opinion of the person defending corrections, force, or “discipline,” that there are entire classes of dogs that can’t be trained to fluency without aversives. So what’s really wrong with this picture? This argument is usually put forth by “balanced trainers,” who believe in using both positive reinforcement and corrections. Typical of the latter would be collar pops, with some trainers performing those while the dog is wearing an aversive collar such as a prong or choke collar. Also corrections can certainly include shocks with a shock collar. Balanced can sound good on paper. Show the animal both what’s right and what’s wrong and you’ll get there twice as fast! Many other writers have addressed this fallacy. (Deb Jones has a great post about it.). I will merely say here that this view ignores the scientific literature about the fallout from aversive methods, and also ignores what you lose (and the dog loses!) by combining the two. This article by Karen Pryor explains it. Implying that trainers who use primarily positive reinforcement are “limiting” themselves by avoiding aversive methods is like criticizing a doctor who rules out treatments with dangerous side effects when safer and equally or more effective alternatives exist. Whose Tools Are Limited Anyway? Hurting, scaring, or annoying an animal is dead easy. You could bring me any vertebrate in the world and I would know how to do it. Let’s say a marmoset. I won’t get graphic, but it doesn’t demand any creativity or even much thought for me to know how to hurt it. It takes no finesse. Likewise, startling any creature doesn’t require expertise. If I have the ability to change the temperature or environment, add sounds, light, movement, or physical pressure, I could easily scare or bother it. But if you asked me what marmosets really enjoy, I would have no clue. They are primates and I kind of think they live in trees. I don’t know what they eat. I would have to learn about the creature and observe it in order to know how to motivate it through positive reinforcement. Whereas hurt is universal. And even though most of us are vastly more familiar with dogs than we are with marmosets, that’s exactly what we do. Force-free trainers study the heck out of any dog we train. How are dogs really different? As individuals. If we rule out deliberate use of aversives during training, we must treat each dog as an individual and learn what turns them on. 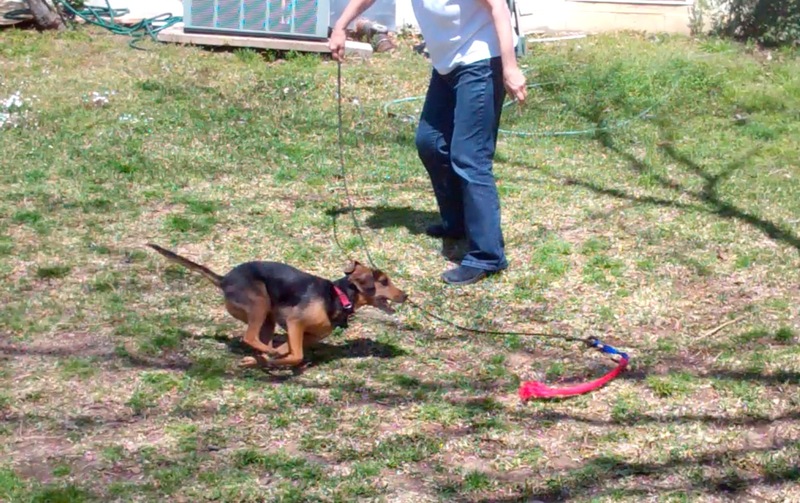 Treating each dog differently is built into the system of training with positive reinforcement. It can’t succeed without that. 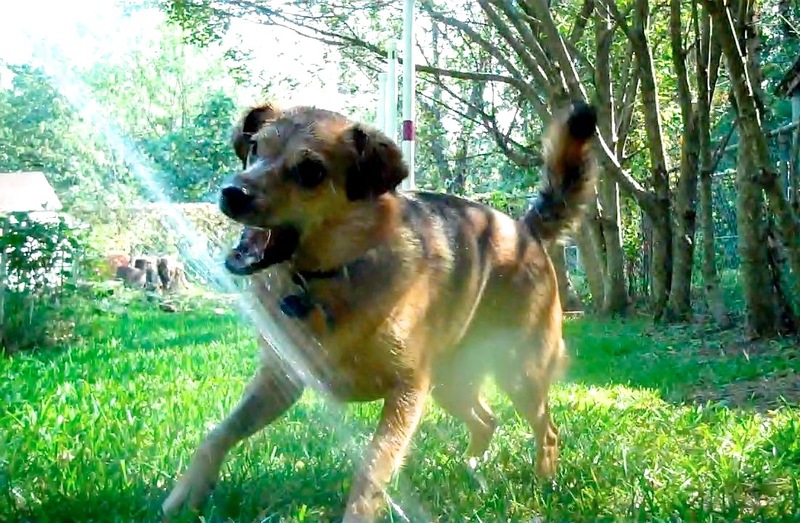 I vastly improved my dog Summer’s agility weave performance by letting her play in the water hose after successfully performing the obstacle. However, if I were to turn the hose on my dog Zani after she did the weaves I would very shortly have a dog who would not weave at all. Clara and Zani love the flirt pole; Summer walks away from it. Although I can certainly condition them to like certain activities, it gives me real joy to discover the quirky things that they innately enjoy. Training with punishment doesn’t require a lot of study of the individual animal. And anyone who did put the amount of study into punishment methods that positive reinforcement trainers put into reinforcement would likely be called a sadist. The fact is that it is much easier to figure out how to hurt or stress a creature than it is to figure out the palette of things it loves best in the world, not to mention how to use them. So who is it again who’s using a cookie cutter method? It would have been fun to end the post on that zinger, but I have more to say. One of the things that triggered this post is a comment I read by a balanced trainer. She said emphatically that people who were talking about trainers hurting dogs had obviously never seen a dog in pain. She said dogs in pain acted panicked and lost their wits. I hope I misunderstood her. If that is what she must see before she agrees that a dog is in pain, I feel really badly for her dogs. But it brings up a really important point. Not only do dogs likely have different pain thresholds, but breed and personality differences create differences in how much pain they show. I believe that my 12 pound rat terrier Cricket is the physically toughest of all my dogs. I mean in literal ways. She flinches less for shots. The pads of her feet are tough and her toenails aren’t sensitive. Both times she was badly injured by a big dog, she never let out a peep, during or after. But I may be wrong. It may be that she is more stoic. She may feel as much pain, but not show it. We can’t know how much pain dogs are experiencing when they are physically punished. People who use punishment have to guess from the results they get. It only stands to reason that in some cases the dogs are probably more hurt than the trainer is aware. With reinforcement, we also have to guess from the results we get. Some dogs may not be as obvious as others when something delights them. But if my dog is happier than I know because of something I have given her, there is no harm done. In my experience, when someone says, “But every dog is different,” what they are actually claiming is, “There are some classes of dogs that can’t be trained to fluency without aversives.” I say this because of what always follows the “different” claim: a discussion of types of dogs who are supposedly exceptions. When a force-free trainer gives examples of highly successful training with any of these types of dogs, they are met either with circular reasoning (“well it wasn’t really a high drive dog,” or “it wasn’t from working lines”), quibbling about the details, or silence. What I honestly think the claim boils down to: it’s OK to use aversives on particular dogs or particular behaviors that are hard for that particular person to train to the degree of reliability or precision they want. And that most of the people who say “all dogs are different” believe that since they don’t know how to get the results they want without aversives, it can’t be done. And because punishment comes so naturally to all of us. Back to the marmoset. I said I could easily bother, startle, or hurt it. But one problem is that I don’t know enough to be sure which of these would actually happen. I might set out to bother it with a temperature change, and if it’s more sensitive than I guessed, I could injure or even kill it. We think we are experts on dogs because they live with us. However, the same problem is present. A person could apply corrections as a part of training the dog to what felt like a reasonable degree and cause permanent damage. We read about extreme cases of this since they make the news or in this case, a peer-reviewed article. But injuries from aversive collars and even from the pressure of dogs pulling on flat collars are increasingly well documented. I believe that balanced trainers are not trying to cause permanent injury to their dogs. The handwriting is on the wall though, that they could be risking their dogs’ physical health if they use aversive methods, especially on the dogs’ necks. And the even more likely deleterious effects to their dog’s emotional health are well described in any Psych 101 textbook. I think defending the use of aversives for “some dogs” is about our human susceptibility to the seduction of punishment, and not about treating dogs as individuals at all. Thanks to April and Margery for their help with the ideas in this post, and Sonya for the cool cookie cutter photo. Thanks to Clara for making me smile. Link to the video of Clara and me ripping up cardboard together for email subscribers.